Children have to face multiple health concerns in our world today—whether they are born with a health condition, or develop one. Children might face health issues including such as ADHD, arthritis, allergies/asthma, autism, or diabetes., blindness, or deafness. Ear infections are an extremely common childhood illness and should not be taken lightly as it can develop into long-term (chronic) conditions. Parents need to be aware of these heath concerns which make newborn screenings so important. 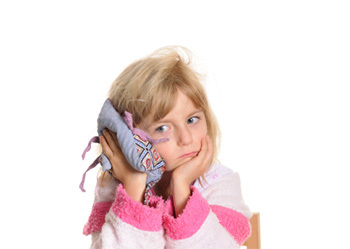 Every year, millions of children visit the doctor as a result of ear infections. Ear infections are extremely common in young children–with 90% of all children experiencinge one or multiple infections prior to school age. Acute otitis media (AOM) is a condition which involves inflammation and intense symptoms and signsor of an infection the middle of the ear. Dulled hearing, fever, earaches, and nausea/vomiting are symptoms that can occur during an ear infection. When cold and flu season hits, your child may encounter the “bug” at school or daycare. Your child’s immune system is not fully developed at a young age which makes them more vulnerable to illnesses. The cold and flu are generally caused by a virus. Cold symptoms are normally mild and develop 2-5 days after your child is exposed to someone else who is sick. Symptoms can include fever, runny or stuffy nose, sore throat, cough, headache, and muscle aches. Flu symptoms are very similar to cold symptoms; however, they are generally much worse. Children who have the flu will typically have a quick onset of a high fever, severe headache, and muscle aches, chills, funny nose, nasal congestion, cough, sore throat, vomiting, nausea, and fatigue. Eczema is a term used for a group of medical conditions that cause the skin to become inflamed or irritated. The most common form of eczema is atopic dermatitis (atopic eczema). Eczema affect approximately 10 to 20 percent of infants in the United States. Most children grow out of it by the age of 10, while some children continue to have symptoms that come and go throughout life. There are numerous skin conditions your child may experience which can include diaper rash and infections, dry skin, and hives. Your child can also come in contact with lice, develop eczema, or get sunburned. No matter what area of the skin is affected, eczema is always extremely itchy. Sometimes the itching will come prior to the formation of the rash, but when it does, the rash generally is located on the face, back of the knees, wrists, hands, or feet. The areas of the body that are affected by eczema are normally very dry, thickened, or scaly. In infants, the itchy rash can create an oozing, crusting condition that happens commonly on the face and scalp. Eczema is also known to be accompanied with hay fever or asthma. Asthma and allergies are some of the most common chronic childhood diseases. In fact, 5 million children living in the United States are affected by asthma, which leads them to miss out on sports, school, and other daily activities. It is important to know what triggers asthma symptoms in children (airborne pollen, cold or other respiratory infections) to prevent a future attack. Symptoms include frequent coughing, whistling or wheezing sound when exhaling, shortness of breath, chest congestion or tightness, chest pain, trouble sleeping, and fatigue. Signs and symptoms of asthma or an asthma attack varies from child to child, and can get worse over time. All kids misbehave sometimes; it’s normal. And some children may have temporary behavioral issues due to stress from a birth of a sibling, a divorce, or a death in the family, which could cause the child to act out. However, behavioral disorders are a little different but much more serious. Behavioral disorders generally include a pattern of hostile, aggressive, or disruptive behaviors for over 6 months. One of the most challenging difficulties for a parent are their child’s behavioral issues–because a “cure” it is not always easy to figure out. A child’s personality is constantly changing as they grow older, which can make it that much more complicated. Speak to your doctor if you start to notice aggressive behaviors in your child because poor choices can lead to bad habits. Children who have behavior problems are at a higher risk for poor school etiquette, mental health issues, or even suicide. If your child is suffering from pediatric conditions, call our office today. We offer many screenings as well as lifestyle counseling.